On opening night at Lincoln Center, in 1962, Leonard Bernstein and the New York Philharmonic, joined by opera singers and a choir, performed music by Beethoven, Mahler, Copland and Vaughan Williams for an audience in tuxedos and gowns. The atmosphere should be decidedly more funky at the concerts that inaugurate the Shed, the 21st-century arts complex devoted to presenting new work, which is just two miles from Lincoln Center. Its first concert series, Soundtrack of America, will celebrate not the European classical sphere but the heritage of African-American music across a broad historical and stylistic spectrum, from spirituals to hip-hop. Most of the crowd will share a dance floor. It’s a statement of purpose, though it also promises to be a party. It signals that the Shed, a $475 million arts center within the Hudson Yards development of luxury retail, name-brand architecture and multimillion-dollar residences, will welcome cultural events and audiences well outside the economic elite. As with all of its programs, some tickets — spread across the room — will be only $10. Soundtrack of America, a five-concert series from April 5-14, is directed by the visual artist and film director Steve McQueen (“12 Years a Slave”) and will feature 25 up-and-coming musicians, five per night, playing roughly 15-minute sets. The performers’ mandate is to view the past from the present, placing songs of their own alongside music that influenced them. Their individual artistic paths are intended to add up to an expansive musical constellation. The opening-night roster includes Jon Batiste, the bandleader for “The Late Show With Stephen Colbert,” and PJ Morton, the Grammy-winning keyboardist from Maroon 5; other nights feature the rapper Smino; the Grammy-winning blues-rocker Fantastic Negrito; the blues-rooted guitarist Melanie Faye; and the idiosyncratic R&B songwriters Moses Sumney and Eryn Allen Kane. 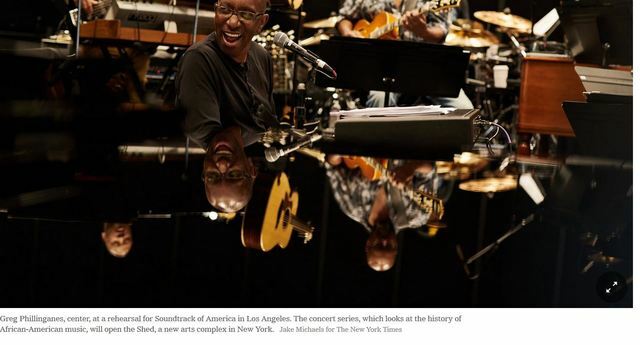 The musicians will be backed by a house band — including horns and strings when needed — led by Greg Phillinganes, the prolifically recorded session keyboardist who has been the musical director for Michael Jackson and Stevie Wonder onstage, among many others. The music, Mr. Phillinganes said, will be unmistakably live. “This is an Auto-Tune-free zone,” he said. The brain trust choosing and advising the performers also includes the history-making producer Quincy Jones, along with two younger producers, Dion Wilson (better known as No I.D., who produced Jay-Z’s album “4:44” and tracks for Kanye West, Drake, Common and Nas) and Tunji Balogun, an executive producer for H.E.R. and Khalid. Mr. McQueen and Mr. Poots, who are both British, knew they needed American perspectives and solid academic underpinnings, so they called on an expert: Maureen Mahon, a cultural anthropologist and associate professor at N.Y.U. who concentrates on African-American music. She oversaw a “family tree” — intended as a suggestion, not a canon — of music: from unrecorded African-American music through work songs, spirituals, blues, jazz, swing, bebop, R&B, rock ’n’ roll, hip-hop and onward. A panel of other advisers included the journalist Nelson George and musicologists with specialties ranging from current trap back to little-documented slavery-era music. The jazz-soul singer and songwriter Sy Smith is hoping to dovetail her father’s doo-wop, her classical music studies, the go-go music she heard while attending Howard University, the mixtape culture of early hip-hop and her current jazz-tinged mode. “I want people to appreciate that we all come from different places to end up where we are,” she said. Jon Pareles has been The Times's chief pop music critic since 1988. A musician, he has played in rock bands, jazz groups and classical ensembles. He majored in music at Yale University.